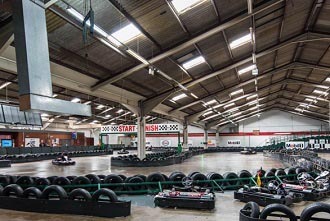 A good sized multi-level kart circuit on the south coast just outside Portsmouth. This is a well run track that can provide race events that will challenge novice and enthusiasts alike and the excellent facilities make this an ideal choice for corporate groups of stag/hen parties. From Junction 11 on the M27 travel south on the A32 and the track is in Fareham Reach just off Fareham Road. Group Activites - Stag/Hen, Corporate Events etc. For larger corporate groups or stag/hen parties over ten drivers there are a range of events that can be provided to suit your requirements. Just provide your preferred date and group size and we can supply full details. There are conference facilities for 40.